by Eric J. Hurwitz. Article created on June 24, 2017. Omni Mount Washington Resort, Bretton Woods, New Hampshire. 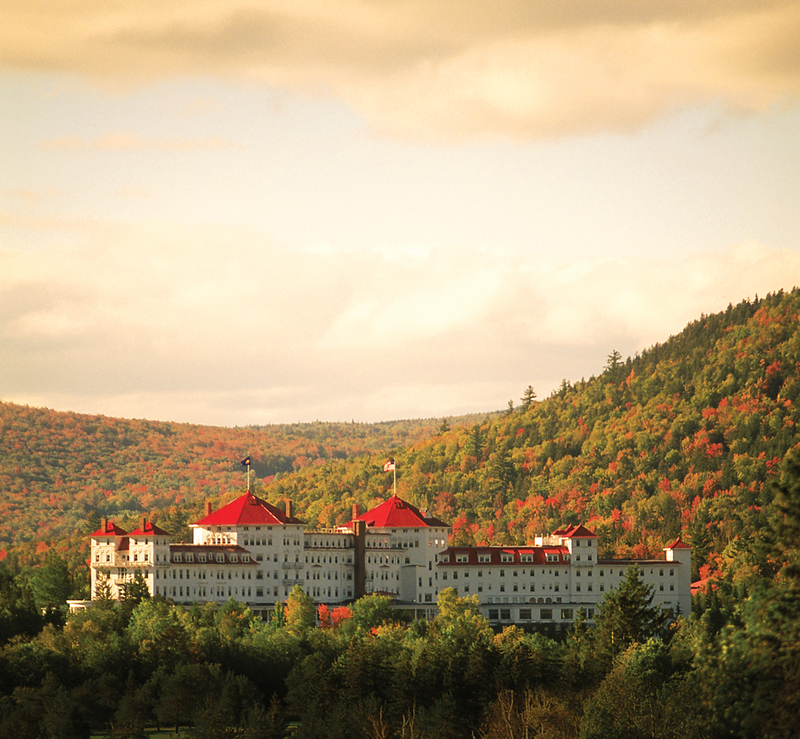 Photo credit: Courtesy of Omni Mount Washington Resort. All communities in New England have fall foliage, but the key is to find lodging in a beautiful vacation town that offers the option to do lots of things -- or just plain relax. There's really nothing like experiencing the refreshing fall air, rustling though leaves at a classic New England town common, a wonderland of fall foliage colors during a Sunday drive, the taste of apple cider and the fresh taste of a freshly-picked apple at an apple orchard, and experiencing true New England community spirit during a fall festival. We highly recommend the "quiet corner" in northeast Connecticut. 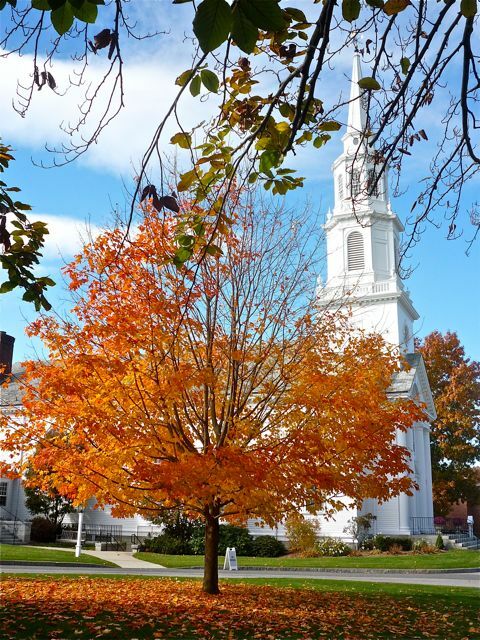 This is a pure, pristine, largely unspoiled area that features small, classic New England towns with town commons and churches with tall white steeples and beautiful "New England" drives along Route 169. You can enjoy some nice restaurants, fine inns, antique shopping and great places to hike and stroll. We love the Inn at Woodstock, an 1816 Federal/Georgian style mansion with a carriage house and two barns. 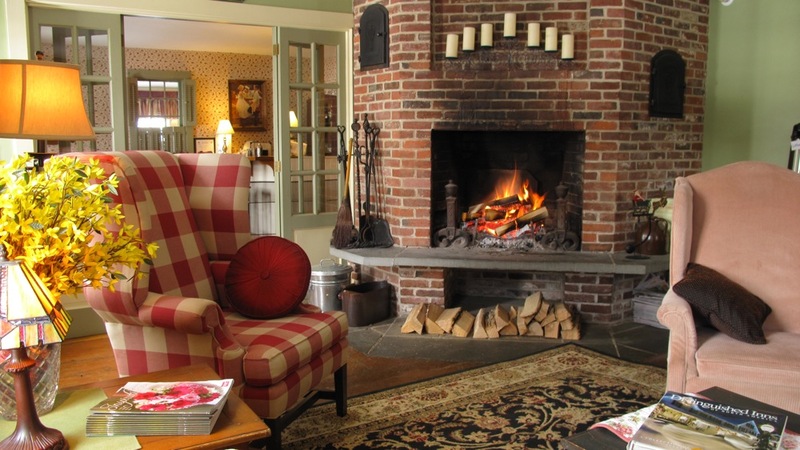 To us, it is everything you could ask for in a New England country inn -- charming, quaint and full of character. They also have a wonderful upscale, but casual restaurant. What a special travel getaway! Log onto our Inn at Woodstock article to learn more about the inn and make reservations. Walking the historic Lexington Battle Green, Walden Pond, the Old North Bridge Area, Great Meadows National Wildlife Refuge, and historic Monument Square in Concord seems all that much better when there's color in the leaves. Walden Pond usually offers the best fall foliage experience here, as its innate, expansive natural beauty remains intact. You'll experience a scenic 45-minute, 1.7-mile hiking path around the beautiful 61-acre pond filled with different perspectives of the clear pond as well as a virtual forest featuring different types of trees. Often thought of as one of the most pleasant Berkshire Mountains vacation destinations, this small town -- best known for the Tanglewood Music Festival summer concert series -- offers rural beauty and splendid lake and mountain views. It is a town of a town of quaint shops, fine dining choices, and historic buildings. During its peak, the fall foliage ranks up there with the best in New England. Mt. Greylock -- about 45 minutes north of Lenox -- boasts the highest point in Massachusetts at 3,491 feet, but the height just begins to tell the story: the "Hairpin Turn" affords absolutely spectacular 100-mile autumn views of Massachusetts, Vermont, New York, Connecticut and New Hampshire. This appealing Berkshire Mountains town has one of the nicest small New England downtowns, anchored by locally-owned businesses and the landmark Red Lion Inn. Stockbridge has been made famous by James Taylor ("Sweet Baby James)" and Norman Rockwell (there is a Norman Rockwell Museum in Stockbridge). On Route 20, Sturbridge is a mish-mash of stores and lodging, but serves as a great starting point to Old Sturbridge Village, an outdoor living museum recreating the 1830s and the lovely, unspoiled Quobaog Hills Region. Here, you can find some of New England's most beautiful, virtually untouched towns and villages (West Brookfield, Brookfield, Brimfield, etc.) with appealing town commons, country stores, apple orchards, fresh air, nice country drives and some truly colorful fall foliage. This mountain resort town is right near Mt. Washington the highest point in New England at 6,288 ft. It's a resort area at the base of the mountain where the foliage and nearby fall events and attractions make for a perfect, scenic New England autumn destination. Bretton Woods is a great foundation to the 18,000 acres of forest land in White Mountain National Forest providing additional spectacular mountain and forest scenery and numerous recreational opportunities. A famous covered bridge, Wildcat River's water rushing over rock formations and Storyland (storybook settings for children in this theme park) highlight this quiet New Hampshire retreat in White Mountain National Forest. Christmas Farm Inn and Spa sitting area. Photo credit: Christmas Farm Inn and Spa. It's busier than in the past -- thanks to outlet stores -- but with views of Mt. Washington, lots of shopping, dining, and scenery galore (including proximity to the foliage-famous 34-mile long Kancamagus Highway), North Conway is a splendid New Hampshire foliage destination. The tall white church steeple, panoramic mountain and farm views, and a relaxing, classic small downtown with a general store make Stowe the quintessential Vermont town. This idyllic village, tucked away in the dramatic Green Mountains -- is surrounded by brilliant fall colors. The winding country roads are so pleasing -- one leads to the notch road to Jeffersonville with dramatic, twists and turns and spectacular rock outcroppings, immediately colder temperatures and flashes of intense colors through the dense forest. A 5.5 mile bike trail winding through the beautiful country and mountains is another way to take in the foliage. One of the mountain ranges, Mt. Mansfield, is perfect for fall hiking (check weather conditions first before embarking on a hike). At 4,395 ft., Mt. Mansfield is the highest point in Vermont and is capable of having some snow at the peak in the fall, making for some of the most stunning views in New England. The Village has no chain stores and features charming, little shops, restaurants, and fine old homes and inns. Outside of town is Mountain Rd., offers beautiful mountain views, and has a spread-out variety of more stores. Woodstock is another beautiful Vermont small town, often referred to as the town you'd most likely see on a postcard. The Town Common is perhaps one of the best examples of its kind in New England and National Geographic Magazine as one of the prettiest towns in America. Although modern shops and restaurants line the downtown, there is an old-fashioned charm to Woodstock that has a timeless feel. Fall Scene in Concord, Massachusetts. Massachusetts Town Greens -- Discover New England's first travel attractions: town commons! The Best Diners in New England -- If you love classic diners, New England has them! In my book, I write in detail on 50 top local diners. Relax and stay for a while: Start with our navigation links and also our articles on the best New England towns and cities, hidden travel destinations, scenic drives, seafood restaurants and lobster shacks, lobster rolls, ice cream stands, and country stores, as well as our New England summer, fall, winter and spring sections. Then take a fun online journey on VisitingNewEngland to read the rest of our articles for your trip planning needs!